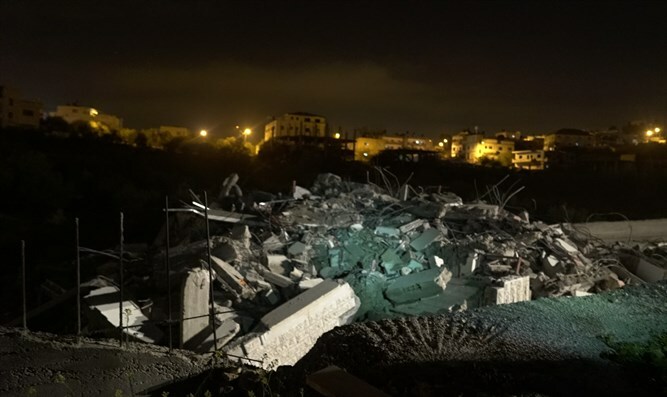 IDF confirms it demolished home of terrorist who murdered two haredi soldiers. Palestinian Arab media reported on Wednesday night that IDF soldiers had entered Kobar in order to demolish the home of the terrorist. Justice Neal Hendel wrote in his ruling, "I will make do with saying that the secret material which we have examined, with the petitioners' consent, unequivocally supports the first option (effective demolition), and teaches that the general deterrence effect is still valid. I will add that the material presented is comprehensive, complete and balanced, and in many ways even surprising in its intensity." Meanwhile, the family of the terrorist Arafat Irfaiya was notified on Wednesday morning of the IDF's intent to demolish the terrorist's residence. The terrorist murdered Ori Ansbacher in a forest near Jerusalem on February 7, 2019. The family of the terrorist was given the option to challenge the IDF's intention.